This is Winston. The second picture is him just after arriving here at Seven Star. Winston was used as a bait dog so he has quite a few scars and you can see the wound on his nose. It has healed very nicely. Winston is a wonderful boy, very calm and sweet. I have not found anything that gets Winston excited, he gets along with all the other dogs and cats here. He loves to be petted and taken for walks. He is looking for his forever home. UPDATE: Winston has been adopted!! 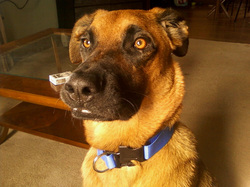 Louie is part German-shepard. He is a very sweet boy, he is going to be a big boy when he grows up. Update: Louie has been adopted!! Penelope is a Lab/Beagle mix. She is a very active girl and very sweet. Update: Penelope has been adopted!! Buddy/ Houdini is a lab, pit bull mix. He loves to run almost as much as he loves being petted. Update: Buddy has been adopted and is having a great time running on a 48 acre farm. Hockey is currently being fostered in Michigan. Update: Hockey has been adopted! His new name is Dash. This is a picture of him dressed up as Batman for Halloween. Brownie is a basset hound/ beagle mix. Update: Brownie has been adopted and is now called Bucket! 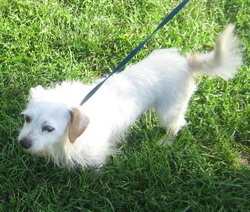 Charlie is a terrier mix. 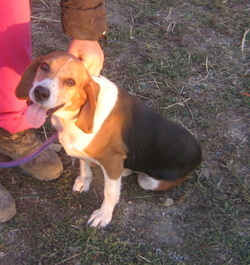 Update: Charlie has been adopted by a wonderful couple in Paris, KY. 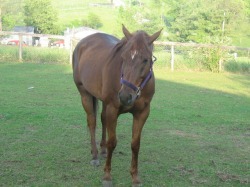 This is Oh Susanne, she is a Ky Mountain horse. She is a very loving girl and very elegant. She came to live with us in 2008. Susanne has been adopted to a wonderful woman who treats her like a queen. This is Battle Field Kid, we just call him Kid. He was born on March 20th, 2009. His mother was Battle Field Angel and his father is All Star Kid. 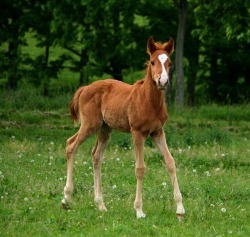 Sadly his mother had to be put down the morning after he was born due to complications from foaling. So Kid came here and we just fell in love with him the minute we saw his cute little face. He has been raised as a bottle baby and is a love bug. 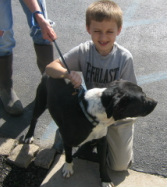 Kid and Sugar have been adopted to a wonderful family and are having a grand time together. This is PaulasSugarCommand, know as Sugar. She is our newest rescue on the farm. 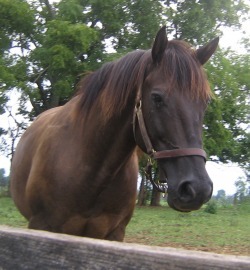 Sugar was at an auction and could have gone to slaughter, but thanks to some help from Another Chance 4 Horses, One Horse at a Time and several members of Fans of Barbaro website she came to live here at Seven Star. 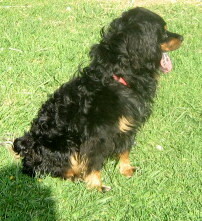 Sugar is a registered paint, breeding stock, as she did not color out. Sugar and Kid have been adopted to a wonderful family and are having a grand time together. This is Twist. 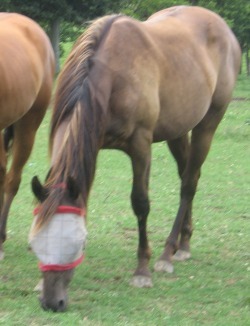 He is a 3 year old gelding. His sire is a quarter horse and his dam is a mustang-paint cross. He is a very sweet boy and loves to be hugged. Twist has been moved to a new home and is doing well. 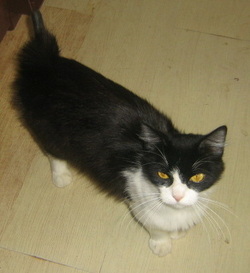 Betsy is a very sweet cat and will be ready to go to a new home as soon as her kittens are weaned and she is spayed. Update: Betsy has been adopted. 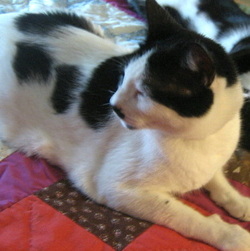 Oreos is a very active and affectionate cat. She has a short tail from an injury, but it just adds to her charm (the fur will grow back). Update: Oreo has been adopted. Her new name is Boo Boo. Sebastian is a very loving laid-back cat. Update: Sebastian has been adopted. 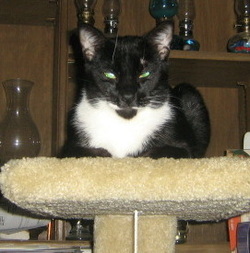 Tuxy is the type of cat that lets you know he is the king of the house. 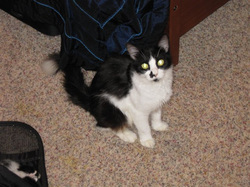 Update: Tuxy has been adopted. Emma is a Lab/Retriever mix. Emma is a very quite and sweet dog who loves to go for walks and be petted. Update: Emma has been adopted. Precious is a Lab mix. 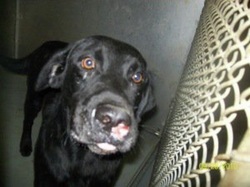 Precious must have been a very abused dog before she came here. When she first arrived she would scream if you even touched her. She has made great improvements and is finally starting to trust people again. She is a very sweet girl. Update: Precious has been adopted and is now know as Lexie. 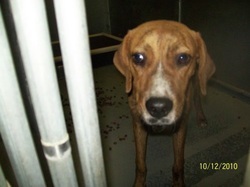 Farthing is a Coonhound mix. 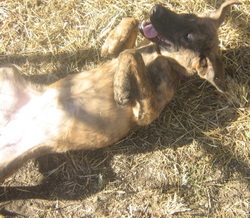 Farthing is a very easy going dog, she is very happy to be going for a long walk with you or just laying at your feet. Update: Farthing has been adopted. This is Daisy Mae. She is a beagle mix. She is a very happy and friendly dog who just wants you to love on her. We believe she was hit by a car and did not heal properly as she has a little problem with her back hip. She gets around fine, just not as fast as some of the other dogs. Update: Daisy has been adopted. This is Dan. He is a hound mix. He definitely has the howl of a hound dog. He is very sweet and very social. Update: Dan has been adopted.